I was reading Rands’ 2011 in review earlier, and thought it might be interesting to check my own web traffic stats year-on-year, and list a few of this year’s most popular articles here on the blog. 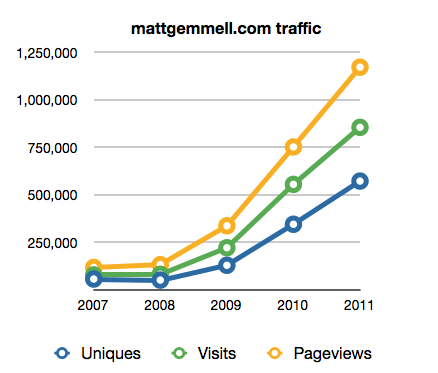 It turns out that 2011 marks something of a milestone for mattgemmell.com. I’ve been writing here for more than 7 years (since 5th September 2004), and this year I’m happy to see that I’ve exceeded one million pageviews (and half a million unique visitors). It’s not a huge number in the grand scheme of things, but it’s worth noting, and I’m proud of it. Here’s a quick graph showing the last five years, from 1st January 2007 through 22nd December 2011. The granularity is yearly. I’m thrilled at the steady increase in traffic, and I’m deeply gratified that my writing here is being read (if not always exactly enjoyed, I’m sure). Here are some of the most successful articles I’ve written this year, in rough order of popularity (massaged slightly to reflect some of my own favourites). SEO for Non-Dicks - optimising your search engine ranking without cheating or dishonesty. Apps vs the Web - the argument for native apps rather than web apps. Latest Version - why it’s probably OK to support only the latest version of the OS. Copycats - the shameful culture of mindless product- and design-copying in the tech industry. Simplicity - my quest for simplicity in my life and work. Comments Off - why I switched off comments on this blog. Blogging with Octopress - my move to a static HTML blog, instead of a dynamic system. MacBook Air 11” - my review of the late-2010 model 11” MacBook Air, with screenshots. Makers and Takers - the value and importance of actually creating something, rather than just being a money-handler. Critical Customisation Cost of Software - about my instinctive resistance to customising my computer setup. I look forward to writing here for another seven years, and I hope you’ll continue reading. You can stay up to date via my RSS feed or by following me on Twitter.